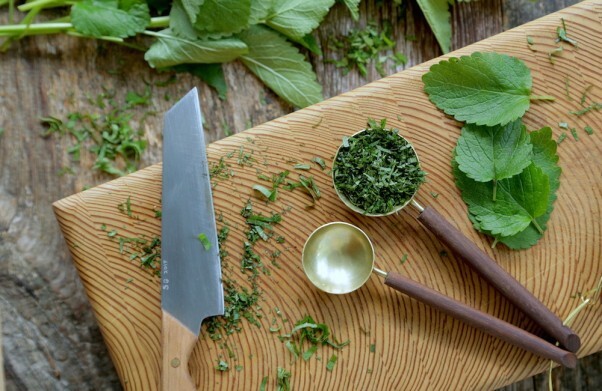 Lemonbalm is a fragrant herb that always seems to grow lush and strong in the garden. It sadly doesn’t get used nearly enough in cooking and as a result, it can be hard to find in stores or even at farmer’s markets. But it’s a very easy to grow and if you don’t have your own, a friendly neighbour might not mind you harvesting a bit from their patch, since it grows back in a flash all through the summer months. Lemonbalm is a perennial in the mint family. Its scent is quite intoxicating and lemony, hence the name. It is known for its numerous medicinal properties including its calming effect on the nervous and digestive systems, and its high antioxidant content. 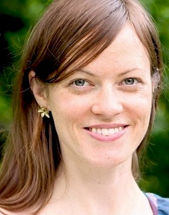 Preliminary studies have even shown it could promote brain health and memory! 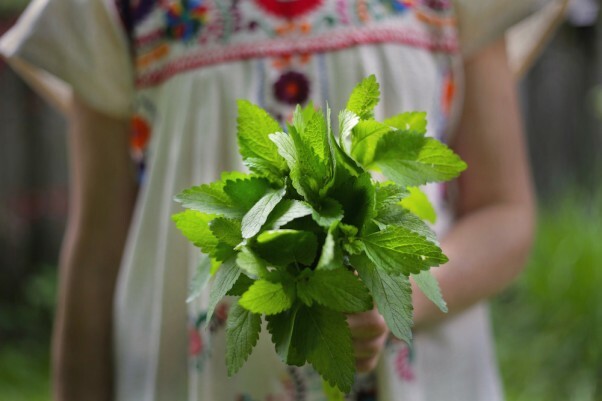 I often use fresh lemonbalm to make a delicious aromatic tea (simply place 4 to 5 leafy stems and steep for 5 to 10 minutes in hot water). But its delicate citrus-like flavour also lends itself well to desserts. Classic shortbread is ridiculously simple to make. You can easily whip up a shortbread batter in about 5 minutes flat and the best part is it can all happen in just one bowl. 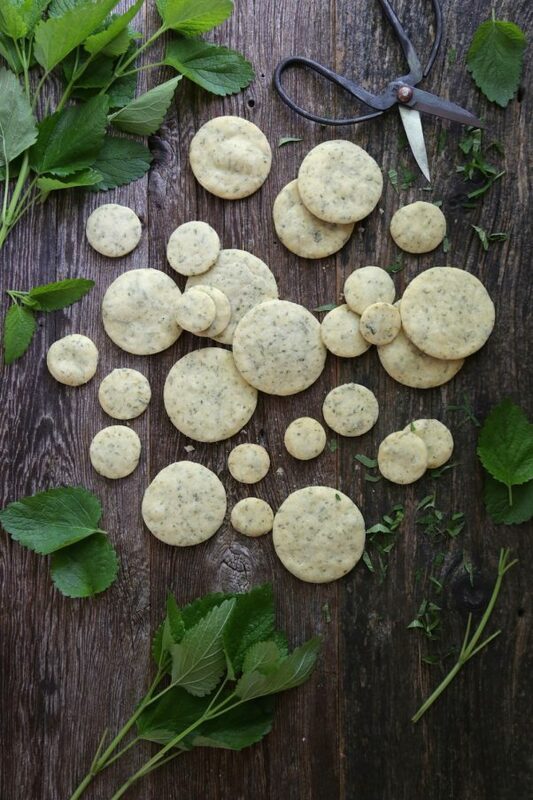 These cookies take a little longer than that, because of the chopping, which needs to be executed attentively and delicately in order not to bruise the tender green leaves (there’s nothing worse than a pile of roughly chopped, mushy, dark bitter herbs). The unbaked cookies also do need to rest and cool in the fridge before baking. But other than that, they’re relatively quick and easy to prepare. 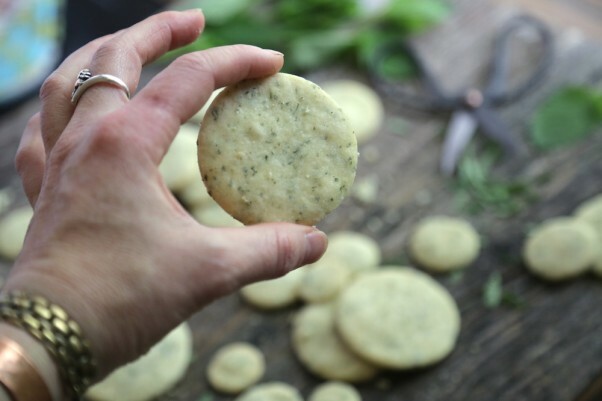 I tested a few batches of these cookies and found that somewhere in the baking, the fragrance of the herb diminishes, hence why my recipe calls for 3 to 4 tablespoons of the chopped fresh herb, which by some standards may seem like a lot. But don’t worry, it won’t be overpowering, the flavour is very subtle. So much so that I like to give these cookies a little lemony “boost” by adding a teaspoon of lemon zest. The two play off each other’s perfumes and the result is quite delightful. Serve it up with some fresh lemonbalm tea and you’ve got yourself a decadent little treat for a summertime afternoon. Enjoy! 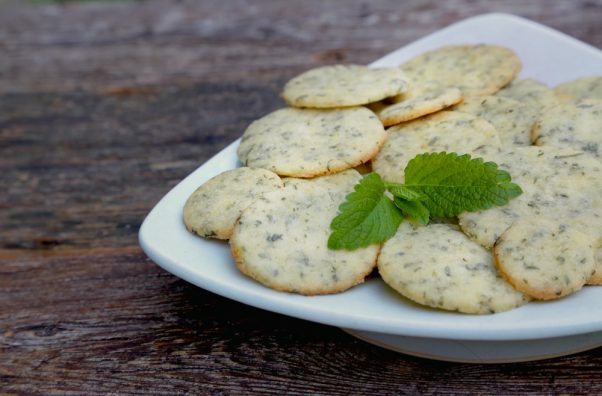 Serve lemon balm shortbread with some fresh lemonbalm tea and you’ve got yourself a decadent little treat for a summertime afternoon. Aube Giroux shares more about this dish in the Kitchen Vignettes blog. Rinse the lemonbalm well and shake the excess water off, then allow to air dry completely. (A salad spinner speeds up the task). Fresh herbs should never be chopped when wet, so be sure the leaves are 100% dry after rinsing. Pick off the leaves and discard the stems, then pile the leaves on top of each other, a dozen at a time, and roll into a tight “cigar”. Using a sharp knife, slice very thinly. Pile the shredded herbs into a mound and chop them up a bit more, until quite fine. Use right away. In a medium bowl, beat together the room temperature butter, chopped herb, fresh lemon zest, salt, and sugar until well mixed. Add the flour and mix well. You may need to use your hands for the final part of mixing. You can also use an electric mixer, just be sure not to overwork the dough after the flour has been added. Once the dough is smooth and coming together, roll it into a ball and flatten it. Wrap tightly in wax paper and chill for 20 minutes. Roll the flattened disc out on a lightly floured countertop and cut into shapes using a cookie cutter. Quick tip: shortbread dough can be a bit finicky to roll out (it can’t be too warm or too cool because of all that butter). So you can skip the whole rolling out step by shaping the ball of dough into a large cylinder shape, then cooling it in the fridge for 2 hours, and slicing about 1/4 inch thick. Place on a baking sheet lined with parchment paper, about 1 inch apart. If you rolled the dough, refrigerate the unbaked cookies for 20 minutes before baking. This helps them hold their shape and bake more evenly. Bake in a preheated 350 oven for 8 to 10 minutes on a rack placed in the top third of your oven. If your oven is on the hot side, check the cookies after 6 minutes to make sure they aren’t burning.